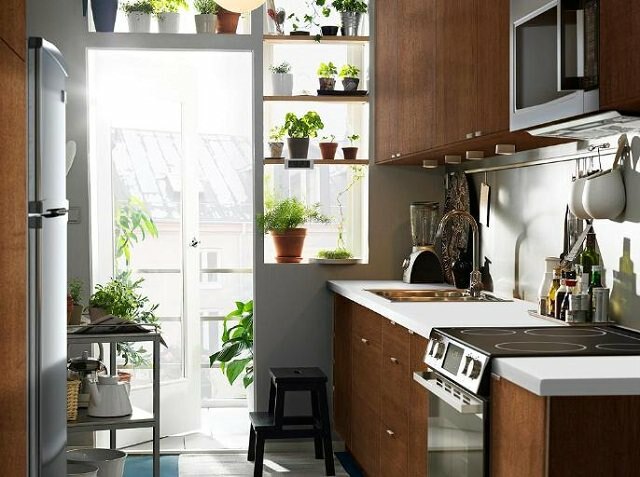 Have you ever wondered to have plants in the kitchen? Why not this is a good place to decorate with some plants. Generally, kitchens have good ventilation with large windows that provide plenty of light and fresh air. However, it can also be a little difficult place for delicate plants because of the fumes, humidity and heat generation by the stove or oven and grease. This is the first and most important step that will decide whether you can grow plants in your kitchen or not. 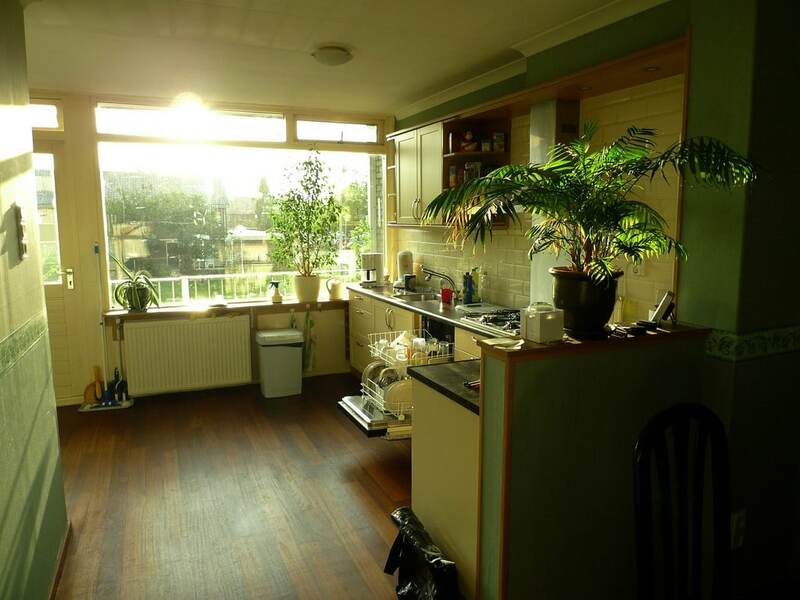 Does your kitchen have a window that receives some amount of direct sunlight? South facing window would be best. It’s simple, the more sunlight the better. If your kitchen window receives indirect sun you’ll need to grow plants that grow without direct sunlight. 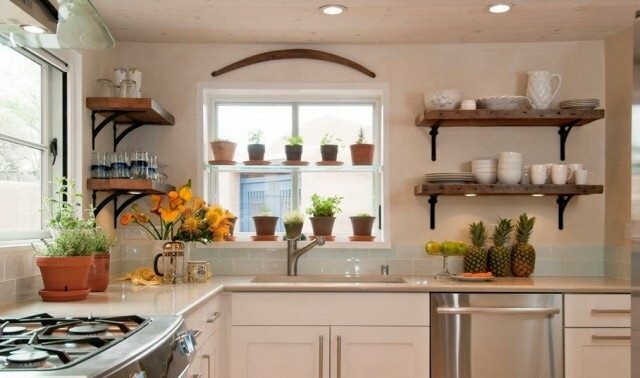 Which plants can you have in the kitchen? Plants that can survive changes in temperature and air currents are best. 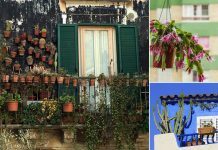 Outdoor plants, if they are placed in a location with good ventilation and lighting can adapt easily into the kitchen, but be sure to remove them a few days abroad. The kitchen is the ideal place to grow herbs. Grow herbs on a kitchen windowsill or in a hanging basket. 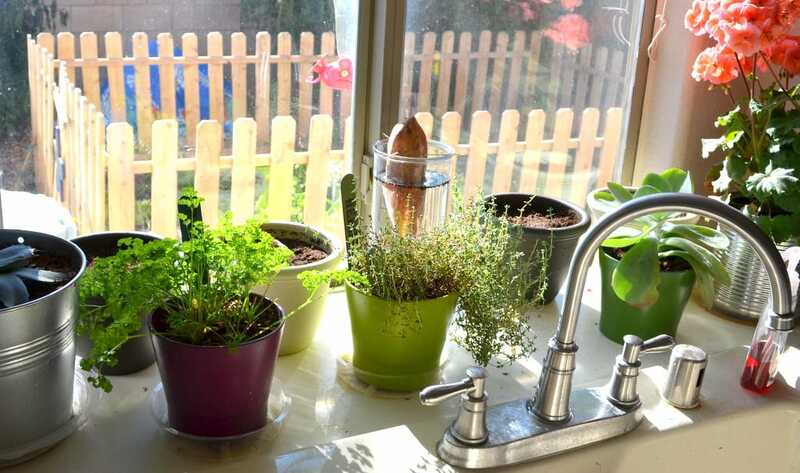 Check out our post on how to grow herbs on a windowsill. 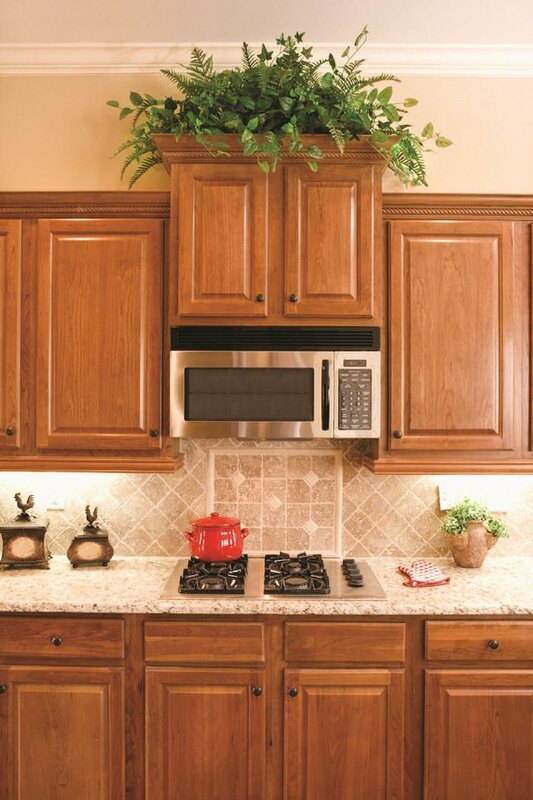 Herbs will not only decorate your kitchen but you’ll get fresh leaves handily to prepare delicious dishes. Herbs such as rosemary, lavender, basil, parsley, lemon balm, lemon grass, mint, oregano, cilantro, and thyme are easy to grow. You can also plant scented geraniums, African violet, begonia and impatiens to enjoy the beautiful flowers. In edibles, small and easy to grow plants like ginger, garlic, green onions, spinach are perfect options. 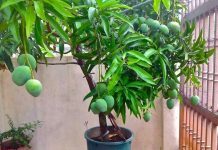 You can also try to grow a lemon tree. 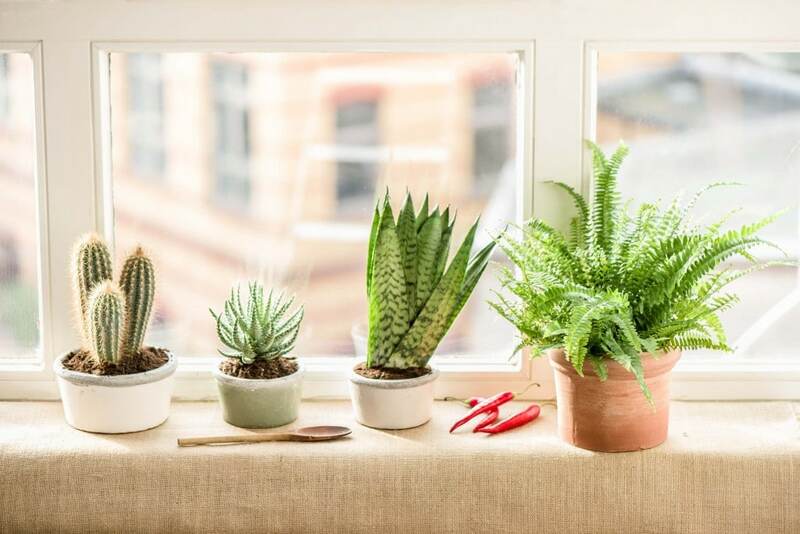 The easiest kitchen plants you can have are aloes, snake plant, pothos, philodendrons, ferns, spider plant, ivies and much more, see our guide on the most easy to grow indoor plants for more options. 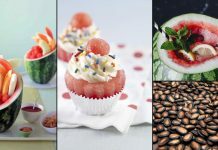 You can also combine these or herbs with other ornamental plants to decorate your kitchen and to make the cooking more enjoyable. 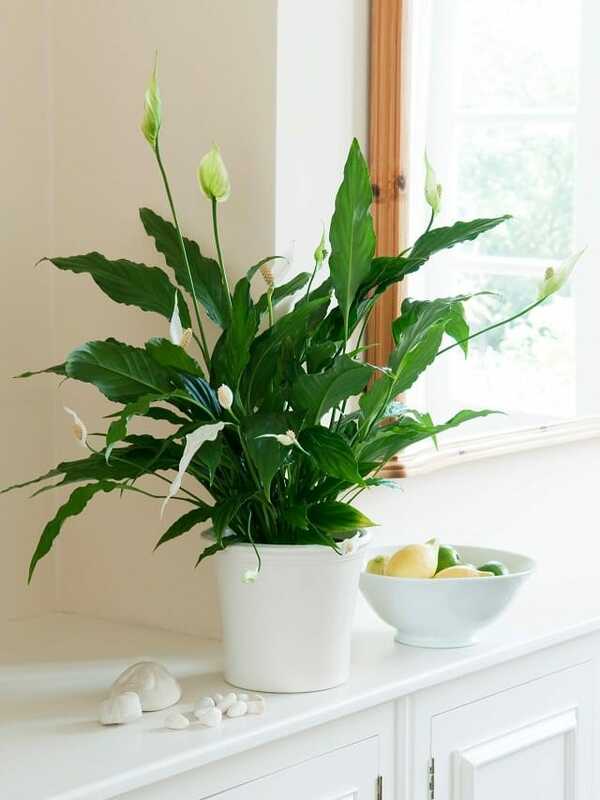 Some plant species, in particular, have the capacity to absorb odors and purify air and are good to grow in the kitchen, like the peace lily, jasmine, mum, geranium, mint, Boston fern, rubber plant and gerbera daisy. Take advantage of these natural air fresheners to purify the air in your kitchen. Prefer plants that require little care and attention and adjust well to your conditions, not to mention the species of succulents and cacti, they are ideal to have at home as they are nearly maintenance free and do very well indoors. Which plants you should avoid growing in the kitchen? Avoid plants that can grow too large or spread a lot or those species that have toxic components. Don’t grow any of these common poisonous plants like dieffenbachia, bird of paradise, kafir lily and some common poisonous flowers in your kitchen.